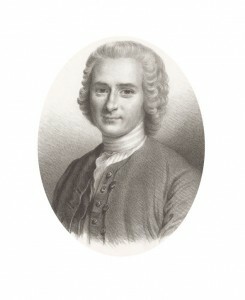 Lithograph after the pastel portrait by La Tour which was presented at the Salon of 1753. Rousseau was about 40 years of age. Rare Books and Special Collections welcomes visitors to an exhibition of selected works from the Rousseau Collection in honour of the 300th anniversary of Jean-Jacques Rousseau’s life, 1712-1778. Philosopher and homme de lettres of Swiss origin, Rousseau first gained wide-spread attention with a prize essay on the arts and sciences which was published in June 1751 when he was the age of thirty-nine. During a moment of introspection, he posited that the revival of the arts and sciences led to the corruption of morals. He upheld that progress was an illusion. In sophisticated society, man was removed from a state of nature and therefore exposed to corruption. Conversely, virtue was possible in a simple society. Henceforth, and in rapid succession, Rousseau produced astounding works of lasting significance: La Nouvelle Héloïse, Émile and the Contrat Social, to name the most well-known. His works provoked debate across Europe and were the cause of his exile in order to escape arrest from the French government and church authorities. Rousseau is also noted for the rich diversity of his oeuvre. This exhibition looks at Rousseau’s contributions to many different fields such as: music, theatre, botany, literature, philosophy, political science and pedagogy. Rousseau worked simultaneously on several of his most famous works, and as a consequence, his ideas are worked out in different genres which ended up unifying his oeuvre. Rousseau also shaped the auto-biographical genre in interesting ways and used it to explain and defend his own writings. Jean- Jacques Rousseau was one of the most influential intellectuals of the eighteenth- century French Enlightenment and an original thinker, largely at odds with the prevailing opinions of the times. 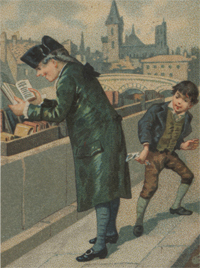 Rare Books and Special Collections has a noteworthy collection on and about Rousseau which was started in the 1950s. With steady and on-going acquisitions, it now includes nearly 250 writings by Rousseau, some of which are first, early or variant editions from the eighteenth century. Many more contemporary commentaries and criticisms on Rousseau also compose part of the Rousseau Collection. It is an interesting supplement to the extraordinary David Hume Collection and to the substantial collection of French Enlightenment authors.